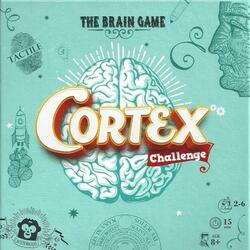 Cortex Challenge challenges all forms of intelligence! 7 different events to have fun with the players' memory, observation skills, coordination and logic. Each of these titles also offers a tactile challenge. Challenge Cortex is available in "Geo" and "Kids" versions, to bring the whole family together around brain games that are easy to play. Contents of the box : 90 cards (74 Event cards, 6 Challenge touch cards, 10 tactile relief touch cards), 6 puzzle brains (24 pieces).